Brexit’s fate is “in the hands of our British friends” after EU leaders agreed to delay the departure date by at least two weeks, says Donald Tusk. If MPs approve Theresa May’s withdrawal deal next week – Brexit would be delayed from 29 March until 22 May. European Council President Mr Tusk said that until 12 April, “anything is possible” including a much longer delay or cancelling Brexit altogether. Speaking in Brussels on Friday, he said he was “really happy” the 27 EU leaders had reached a unanimous decision to extend the two-year Article 50 process, under which the UK was due to leave the EU next Friday. But it’s not the timetable that she chose. Ministers are therefore today not just wondering about how to manage one last heave for the prime minister’s deal, but what they should do next, when – odds on – the whole issue is in the hands of the Commons, not Number 10. 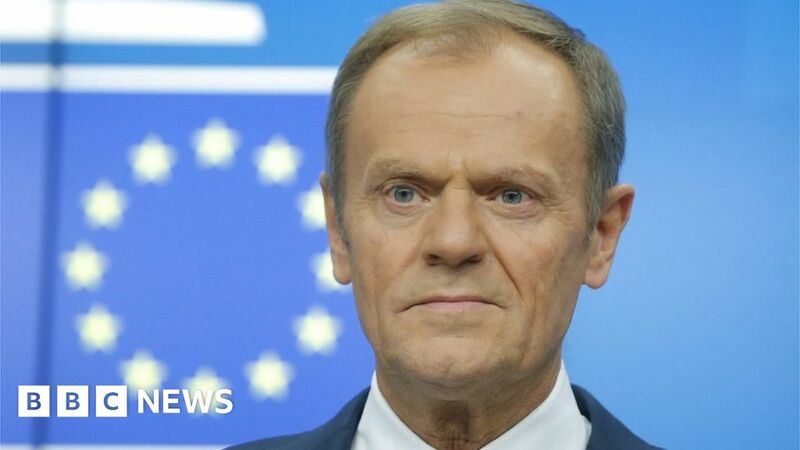 The UK must decide by then whether it will be taking part in European Parliamentary elections from 23-26 May – if it does not, then a long delay would become “impossible”, Mr Tusk said. Theresa May, who had requested an extension of the process until 30 June, has ruled out revoking Article 50, which would cancel Brexit, and has said it would be wrong to ask Britons to vote for candidates for the elections to the European Parliament, due to be held from 23-26 May, three years after they voted to leave the EU. After she returned to the UK on Friday, Downing Street said she had been briefing ministers on her talks with EU leaders. The UK’s departure date is still written in to law as next Friday, 29 March. 12 April: If MPs do not approve the withdrawal deal next week – “all options will remain open” until this date. The UK must propose a way forward before this date for consideration by EU leaders. Mrs May is expected to table secondary legislation – that has to go through the Commons and the Lords by next Friday – to remove 29 March from UK law. The withdrawal deal, negotiated over two years between the UK and EU, sets out the terms of the UK’s departure from the bloc, including the “divorce bill”, the transition period, citizens’ rights and the controversial “backstop” arrangements, aimed at preventing a return to border checks between Northern Ireland and the Republic of Ireland. MPs are expected to vote for a third time on it next week, despite Commons Speaker John Bercow saying what is put forward must be substantially different to be voted on. And fellow Tory MP Steve Double said Mrs May was now “isolated” within the party. “We need to find a way forward and I think that requires new leadership,” he said.